The 2017 Saltire Schools Cup sponsored by MatchPoint, is Scotland Rugby League’s flagship schools competition. Open to every secondary school in Scotland, the MatchPoint Saltire Schools Cup doesn’t require schools to have any previous rugby league experience. Rugby league has seen an immense growth in Scotland over the last few years which will support the development of the sport in the future, and this competition will play a vital role in introducing the game to an ever increasing number of young people throughout Scotland. Where possible we also try to link schools to community clubs to help further develop school-club links. That isn’t to say that if there is no community club in the local area your school can’t participate, Scotland Rugby League encourage all schools to participate in the competition to help aid the development of the sport at a local and national level. Scotland Rugby League is delighted to have George Fairbairn as a patron for the Saltire Schools S4/S5 competition. George (born in Peebles) is a Scottish former rugby league player and coach. He played club football for Wigan, winning the Man of Steel Award in 1980. Fairbairn was also the fullback and goal-kicker for the Great Britain national team, however because the Scotland national squad wasn’t established until 1994 he represented the English national team several times, including the 1975 World Cup. He was later a player-coach at Wigan for the 1980-81 season but was then sold to Hull Kingston Rovers for a record ₤72,500. Fairbairn also became coach of the Scotland national rugby league team from 1995 to 1997 and is the current Manager for the National side. Only two people born in Scotland have played for the England national rugby league team, they are; George Fairbairn, and Andrew Hogg. With 52 goals, George is 1st in the list of England’s all-time goal scorers, with 118 points he is also 1st in the list of England’s all-time point scorers. We welcome George as a patron to the Saltire Schools Rugby League tournament and thank him for his continued support of Scotland Rugby League. Scotland Rugby League is also delighted to have John Risman as the patron for the Saltire Schools S2/S3 Competition. 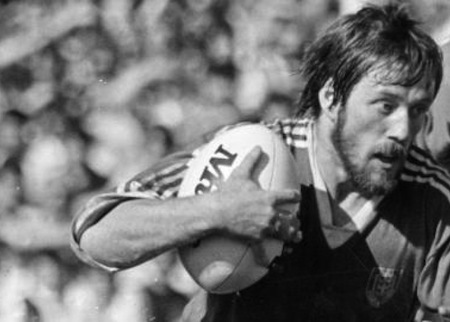 John is a former professional rugby league footballer of the 1970s and ’80s who at representative level has played for Wales, and at club level for Workington Town, Fulham RLFC, Blackpool Borough, and Carlisle, playing at fullback or centre. In the early-eighties John Risman was a teacher of geography and physical education at Salterbeck School in Workington. John’s father was the legendary Gus Risman who debuted his rugby career in 1929 with Salford before earning 17 caps for Great Britain and captaining Workington Town to Challenge Cup victory in 1941. John has had a long history with Scotland Rugby League being involved with the open age set up and heavily involved within the Scotland Students, Under 18’s and Under 16’s as a coach, manager and mentor. Through his efforts both on and off the field and particularly his time involved with the Scotland development teams who toured to Europe frequently over the early 00s, John was given the title President of Scotland Rugby League five years ago and still does fantastic work for Scotland Rugby League.